I really love this quilt set! The colors are beautiful (I bought the pink and grey). It fits my queen size bed with ample side coverage. I washed it already and it held up well. No shrinkage. I wish there were matching drapes for it. I would recommend this for any age female who loves a Parisian theme. Create your dream bedroom look with this Amour Quilt Set. The Paris print in beautiful colors on the quilt and accessory pieces provides a cozy look you will love. With a burst of colors on one side and a printed reverse on the other, this set gives you two great looks in one. Dimensions 21.0 In. X 18.0 In. X 9.0 In. Beautiful, elegant and so soft. My daughter loves it and it matches perfect with the colors we chose for her Room Makeover Surprise for Christmas. Her colors are Pink, Gold, Black, and White. It looks amazing and this bed set was just the final touch! I bought this quilt set in black and white and it is absolutely stunning. I can't stop going up stairs to admire my beautiful Paris themed room! Thank you OverStock.com for having such great quality products at such great prices. If you buy this you will not regret it! I love it! My daughter loves this, especially the decorative pillows that came with it! It took me a long time to find a comforter for my tween granddaughter. She had been talking about going to Paris when she's older. When I saw this, it was perfect. She loves it!!! Brought this for my daughter and she loves it. The pink was not the normal baby pink. It is more like a peachy pink. I was a little sad, but I end up finding the same pink color curtains at bed bath and beyond. I added a wht curtain in the middle.The room turned out great. Bought this for my grandaughter and it's just like the picture. True to the colors. Looks great from 5 feet away and I am happy to own it. Makes my little bedroom pop. But it is not the soft wonderful feel you get from a high quality product. I feel that it was only worth what I paid and not a bargain. I love it! Just the perk I needed for my bedroom. Perfect for my daughter, it’s nice and comfy and heavy all in one. Just received it and can't believe how upscale it looks on the bed. It was everything I expected, very pleased. 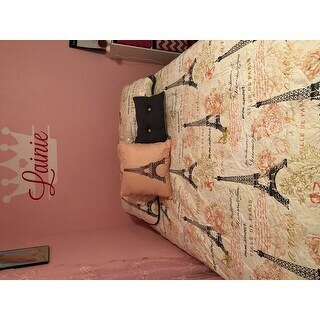 My granddaughter loved it.She absolutely loves how it matches all the other Paris items in her room. My youngest daughter loves Paris and blush pink! I THINK she will be very pleased with this gift. "Does the King Set come with King Size Shams as the measurements are the same as the queen shams? Thank you :)"
All the shams are 21 x 27.